Rabbi Tzvi and Tali Wohlgelernter are due to arrive at Rutgers in August 2017. They will be accompanied by their adorable daughters: Dodi, Sophie and Atara. The Wohlgelerters can’t wait to meet everyone on campus and serve as a meaningful part of their lives on campus. Rabbi Tzvi Wohlgelernter – Grew up in Toronto. He studied in Yeshivat Sha’alvim for two years. After which he served in the Nachal Brigade of the IDF. Then after marrying Tali, he went on to receive a BA in psychology from the Hebrew Theological College in Skokie, Illinois. He has semicha from Yeshivat Netiv Aryeh and Rabbi Zalman Nechemia Goldberg, and is on his way to receiving semicha from the Chief Rabbinate of Israel. Tzvi is also a certified psychotherapist from the Family Institute of Jerusalem. Tzvi has taught Rav Kook’s philosophy and Chassidut at MATAN center for woman’s learning. Over the last year and half Tzvi has served as the Interim Rabbi for Beit Knesset Ohel Ari in Ra’anana. He enjoys tisches, hockey (classic Canadian) and jamming with his guitar. Tali Wohlgelernter– Grew up in Chicago. 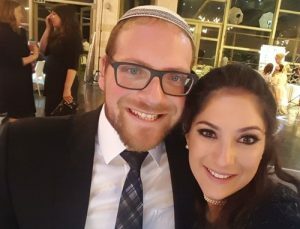 She studied at Sha’alvim for Women for a year and a half. After her time in Israel Tali received her BA in Judaic studies from the Anne Blitstein Teachers Institue in Chicago. After receving her BA, Tali went on to study photography. In 2010, Tali moved to Israel where she continued to study photography and also became a certified international makeup artist. Over the last 3 years Tali has been teaching in a gap year program for post high school girls, called Midreshet Torat Chessed. Additionally Tali is a certified teacher of family purity from Tzohar. Tali loves shopping for new makeup, cooking (and eating), and hosting people in her home.